Strawberries freeze beautifully. 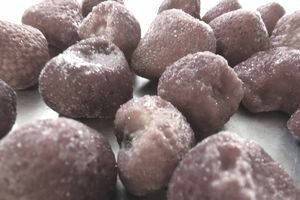 Buy a bunch in June, when they're at their cheapest and tastiest; then, freeze them to use throughout the year. Wash the strawberries in cool water, and pat them dry. Sort out any damaged berries and debris (stems, leaves, etc.). Hull the strawberries (that's fancy for remove the stems). Then, arrange the strawberries in a single layer on a cookie sheet, and place them in the freezer. Once frozen, transfer the berries to freezer bags, and store them in the freezer until you're ready to use them. Strawberries will keep in the freezer indefinitely, but are best when used within six months of freezing. Invest in a strawberry huller. They cost very little, and make fast work of removing the stems. They also result in almost no waste. When you cut the stems off with a knife, you inevitably loose some of the berry. I own several strawberry hullers, so when I have a ton of berries to process, I can get my family to help. My advice: buy a strawberry huller for each person in your household. They take up very little space in a drawer, so you really can't have too many. The old-fashioned metal, pincher type works great. There's really no need to spend more on a fancier model. Too busy to can? Freeze your berries now. Then, pull them out when you have more time. It won't affect the quality of your jam or jelly at all. Frozen strawberries are best used in recipes. Try them in smoothies, baked goods, ice cream or jam. Here's a simple recipe for strawberry popsicles. Need more ideas? Check out all of these strawberry recipes. You're sure to run out of berries before you get through all of them. If you have loads of strawberries, consider dehydrating some of them. They'll take less space to store, and they'll be a wonderful addition to granola, oatmeal and cold cereals. They can even be rehydrated later and used in place of the fresh strawberries called for in recipes. Cut down on the number of mystery items in your freezer by labeling your bags with the contents and date. Here are some free, printable freezer labels that you can use. Use this printable freezer inventory list to stay on top of what's in your freezer, so you use things up before they become freezer burned.